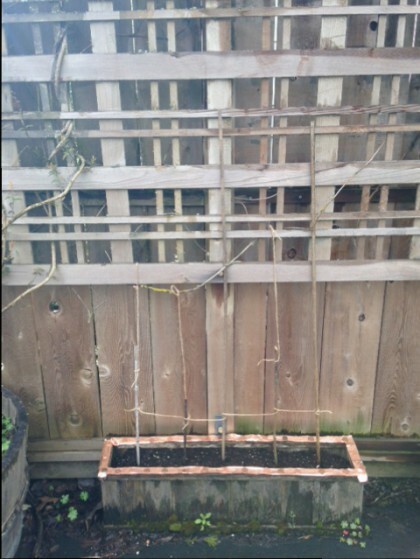 Some of you may remember that in my post Absent Minded Gardener I posted a photo of a planter with a home made “ladder” of sticks and twine protected from slugs by copper tape and pennies where I planted some sugar snap pea seeds and waited. 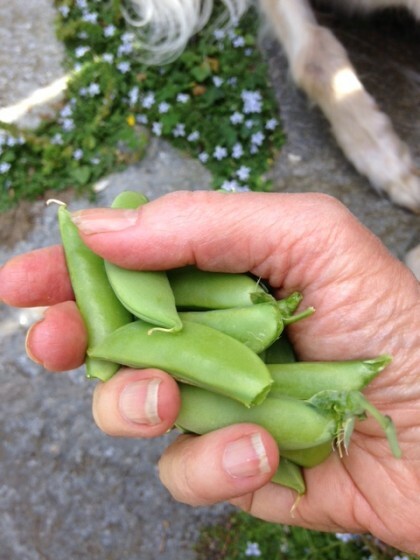 allowing me to hold the sugar snap peas in the first photo above in my very own hand and eat them my very own self, some right off the vine, some carefully saved for a steam fry with tofu, rice, garlic and a little Thai sweet red chili sauce. It turns out my Mrs. Magoo aspect has grown herself some mighty fine sugar snap peas. Though it’s a different color, it appears to be the exact same model my parents drove away in on their honeymoon, and then drove us around in until I was 12 years old. 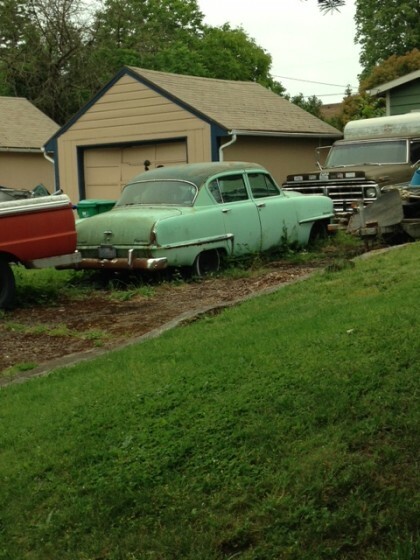 It drove many a neighborhood kid to school and back, and when my Mom went back to teaching, it drove her to school as well. It was affectionately referred to in our neighborhood as “the blue bomb,” aptly named for its deep blue color. It was a funny sensation to stumble upon this one by accident on our way to Woodlawn Park and be transported to my own personal past, as we drifted through an old Portland neighborhood known as the Woodlawn Triangle, which is completely off the design of the angular street grids around it and, I like to imagine, walking through it is perhaps somewhat like flying a plane through the famous Bermuda Triangle. Once a farming community established in the 1860’s, it’s older than Portland proper, and the design of the city was built around it. It’s easy to get completely turned around, and the fact that the street names engraved into the old sidewalks no longer match the ones on the signs doesn’t help a whole lot with the disorientation. I like getting a little lost, so it’s one of my favorite destinations on our morning walks. There’s a park, if you can find it, and at the edge of the grid a lovely Zen Temple in an old building. and Romeo and I often walk through the garden and say good morning to the statues of Buddha placed beautifully amid the flowers and foliage. Best of all it’s at the end of our very own street and is called The Heart of Wisdom. Getting a little lost and finding unexpected treasures, and discovering my sugar snap peas have arrived when just a couple of months ago they were only a hope and a wet seed in the potting soil helps me respect the scale of bigger, more amorphous change in progress. For some intuitive reason, I picked off of my book shelf an old almost falling-apart hardbound copy of The House At Pooh Corner I picked up at a garage sale when I was in college. Even then it was an old friend I wanted to carry with me through life. It’s a reprint of the original by A. A. Milne with the “decorations,” as the illustrations are called, by Ernest Shepherd. As a small child, I’d been read “Halfway Down The Stairs” over and over at my own insistence, and to this day it’s one of my all time favorite poems. But it wasn’t until I was actually 10 years old that I read The House at Pooh Corner. It was a summer I was old enough to ride my bike out of the immediate neighborhood and across a busy street and then into another neighborhood that featured a “back” way to the closest library branch, which was also in the same small shopping complex as my mother’s hairdresser. I was thrilled not to have to go and wait with her to get my books, so exhilarated by the independence that I’d practice riding my bike with no hands as I passed by James Magnum Park and the public swimming pool there. Most of the time I was an adventurous reader, picking books beyond my years. In fact, earlier in the same sumer, I had read Thor Heyerdahl’s Kon Tiki. I loved to make large journeys through words. But as the summer was drawing to a close, I felt like it would be okay to read this “kid’s” book, since there was so much wisdom in the poem I had loved so much, and it seemed to be an ending to the stories that started in Winnie the Pooh. At the time, I believe the end of The House at Pooh Corner helped me feel okay about growing up myself, that it gave me a kind of road map for the value of doing “nothing” (which I wrote about fondly in Under the Pear Tree: Sweet Nothing and In The Room) that I tucked away somewhere and then found again much later when I most needed it. The reminding came again later when Mike was just 5 and some college students I knew read the whole book on the university radio station where I taught. I took Mike to the studio to listen and they gave us tapes of their performance that we listened to at home. But it might have been me who loved hearing it even more than Michael did. So why, I wondered, at 60, was I picking up this book again? I didn’t know exactly, beyond the reason that I’d just finished The Orchardist, and didn’t have another “grown-up” novel I wanted to read during my afternoon rest time. Yet I knew to trust there was something there for me yet again, and I would find it–or it would find me. I probably laughed out loud for two minutes when I read in “The Search For Small” Pooh’s reaction to the following “Order of Looking For Things” he works out when he realizes he’s forgotten to ask Rabbit who Small is. Indeed. I certainly can relate, Pooh. 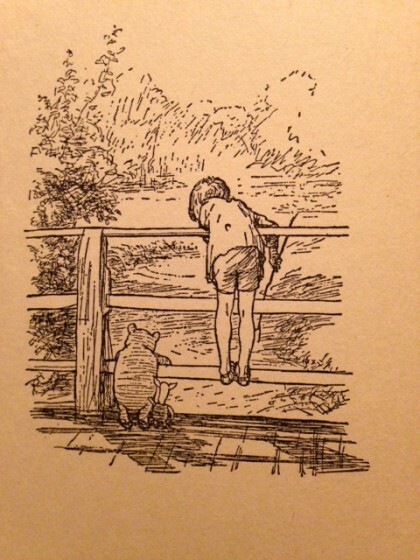 Beyond that, though, in the afternoons that followed, each time I picked up The House at Pooh Corner, I had a growing sense that I was reading it again more than just for fun, and that when I got to that “enchanted place” at the end, I would know why. But when it came, I didn’t expect it to mean so much in so many different dimensions and directions. There are certain things that happen within time that spring from a knowing outside of it. Sometimes that knowing is in a dream, or a passing thought, or an image I return to, or have a particularly strong reaction over. While at the moment it may seem to mean one thing, at a later time, it blossoms into its fullness, simultaneously allowing me to catch a glimpse into the deep tap root, at one with all the myriad leaves and branches that grow from it. Several weeks ago, I had a dream I was riding my bike past James P. Magnum park and public swimming pool, the same route I used to take to the library when I was 10 and discovered The House at Pooh Corner at the Lanai Branch of the Sacramento County Library. In the dream, though, I was riding a “spirit bike” with many others, and we were traveling at a fast clip. The ride was filled with purpose and focus, so I could only note peripherally that unlike my memory in waking life, the pool and park were absolutely jam- packed with people. I could hear the hum of their conversation and activity as I “flew” by on my spirit bike. All of a sudden I heard the woman’s voice who had bought my old house on Asbury Street distinguish itself from the sursurations of the crowd–“that’s her!”, I thought, and said her name to myself in my dream. But my intense spirit bike ride only gave me time to identify and note to myself who she was, and that she had called out–I could not turn back and stop the spirit bike to pick her out of the crowd. A few days after I had this dream, I messaged this woman on facebook to tell her–playfully–that she had called out to me in my dream, but that I was too busy riding my “spirit bike” to be able to stop. I thought a little shared giggle would be the end of it. But after her online laughter, it turns out she had another message altogether. There are very big changes occurring on my old street, shocking ones, and though I am not at liberty to divulge details, this also means a big change for her. And quite likely for the legacy that I thought I had secured for the little blue house that gave me so much. Never at the time of the dream did I think of The House At Pooh Corner. Never when I began reading it again did I think of it as having anything to do with adjusting to a future I cannot determine that is coming nonetheless. But as I got to the final chapter, I saw that this time it would be about my dream and what it really meant, about moving on, letting go, and the inevitable paradox of that which is always in flux yet somehow timeless. I was like Pooh, asking the Christopher Robin in me “Where are we going?” as we headed off for yet another encounter with mystery and enchantment. For those of you who have read the book, you know the crux of this conversation that underlies the inevitability of growing up is reluctance about having to leave a part of life behind in the process that is described by Christopher Robin as “doing nothing.” It is the thing he likes best in the world, and the thing that “they” (the grown-ups) don’t let you do as much of anymore. Once I started to read this part, a flood of unexpected tears started pouring down my cheeks. Oh, how I had hoped for my little blue house to sit there, doing “nothing” but seeing the sun and the garden and its new owner through the day, allowing her to do “sweet nothing” under the pear tree or the ornamental hawthorne, stalwart, amidst the change around it. And how now, like Christopher Robin, I am having to move my vision of it sitting there, forever, in the form I remember it, to an enchanted place of its own, not unlike where Christopher Robin leaves Pooh, where we are assured a boy and his bear will always be playing. At the same time, I was transported back to the end of my own childhood, the summer I read this and understood it all too well, and how now, suddenly, I knew in my dream that I couldn’t stop to turn and talk to the woman who called out, I could only acknowledge her presence and her acknowledgment of me and continue on, my heart full of the connection the house gave us nonetheless. Always, in our hearts, we will share the love of that special place. That this memory of riding back from the library after returning this book, with thoughts of the inevitable loss in life in my head, and ways the imagination can help keep what we love with us, would become a taproot to help hold me strong as these new winds of change blow in is nothing short of a slow motion miracle. It isn’t the kind that comes from eating kale and sweet potatoes instead of bacon, but it is the kind that lets me know there is nothing in my life that is not lived without some overarching purpose so immense I can only glimpse it moving through the enchanted forest of the universe, giving me the strength to ride my spirit bike with a trust beyond understanding. Pooh and Christopher Robin, “decoration” by Ernest H. Shepard, from my 1958 copy of The House At Pooh Corner, by A. A. Milne. what a lovely story. my husband and I have taking many,many cycling vacations in Portland. (we arrive via Amtrak) I have ridden through triangle. next time I will look for the garden with the Buddhas. Thanks Marge! So glad you enjoyed it. That sounds like such a lovely vacation you and your husband take!The Heart of Wisdom Temple is on 10th, just past Holman–at the very edge of the triangle. Oh, Maria, your last two grafs nearly made me cry. What a lovely meditation on the meaning of The House at Pooh Corner, and on growing up and letting things go. To acknowledge that things are always changing and that nothing stays the same seems to be such a mandatory part of getting older and wiser, and yet that desire you speak of–to create places, real or imagined, where things will always remain the same–never really goes away, at least not in my experience. Thanks for this post. You have been steadily inching up to Anne Lamott – favorite writer status – for some time now. This one did it, you just rode by her on your spirit bike, for me. No small accomplishment, that. So healing, in so many ways. Colleen, you are most welcome. And thank YOU for this amazing comment. . .such a gift. . .came at the perfect time, too. . .can’t even say what it means. . .blessings! 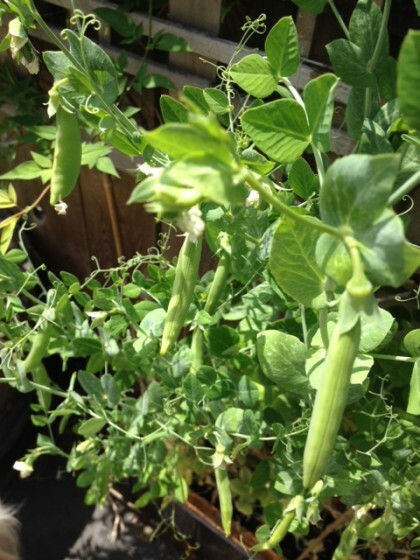 Also, I’m delighted that your snow peas are coming into their own–what a treat at what seems like a melancholy time! As always, thanks for the beautifully thought-provoking post. A beautiful tribute to your childhood memories, and linking then and now; showing that we never really stop having to grow up and let go of things we have ties to. And the importance of keeping them in our hearts and minds – where they will live on. Dear Cory, thank you for this heartfelt comment. I am sorry for your loss, and so honored that my post helped to bring back a beautiful memory you have of your mother.